Head is offering $20 off all Head YouTek Rackets in July for participating stores. So that's $40 off the price of any new Head YouTek racket. To get the discount at TennisTopia, just mention you saw this deal on "Tennis-Bargains.com" (or show them the flyer below from your phone). Darrell Haines (the owner of TennisTopia) can offer this discount deal only until the end of the month. So go in and demo a couple if you're curious, they will be happy to help you find the right one for you to try. I am recently a new owner of the YouTek Instinct myself - to replace my trusty 3-4 year old LiquidMetal Instinct Rackets....so I posted up my review on the YouTek or YouTek IG versions which can also be found in the "Racket Reviews" page. HEAD is having a promotion going on through the month of July! Be sure to demo some HEAD frames if you've never tried HEAD racquets before! The summer is heating up and we want to make sure YOU are playing YOUR best this summer! 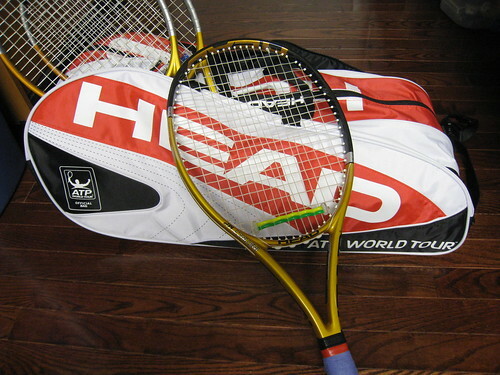 To help you upgrade to a racquet that adapts to your game, HEAD is offering $20 off any HEAD YOUTEK tennis racquet between July 1, 2010 - July 30, 2010. AS AN ADDED BONUS, TOPIA WILL TAKE OFF AN EXTRA $20!! SAVE A TOTAL OF $40 ON ANY HEAD YOUTEK RACQUET!! Come visit Tennis Topia to take advantage of this offer! Live Local. Buy Local. Thank You, We Appreicate Your Business! Join our mailing list by clicking the button below! We will update you whenever sales and specials are taking place!